This is Charles "Fearless" Balke, a great talent in the early days of motorcycle racing whose career was cut short (like far too many from those days) by a tragic accident. He won the first major motorcycle road race in the United States at Elgin, Illinois in 1913. Perhaps most amazing of all is that a scrapbook dutifully prepared by his dedicated wife Edith was uncovered by members of her family while cleaning the attic of her nephew after his passing. More than 90 years after his death a new generation of Edith's family have nominated him for recognition in the American Motorcyclists Hall of Fame. 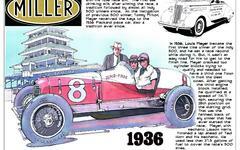 Fearless competed in the first motorcycle races at the Indianapolis Motor Speedway in 1909. 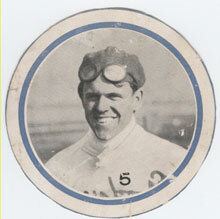 The scrapbook showcases a magnificent career played out on tracks of dirt, gravel and boards in cities across America. It also reveals the commitment of a young wife who so carefully pasted each clipping into place. The love affair of Balke and Miss Edith Bradford, whom he nicknamed “Snooks,” was celebrity news of the day. Newspapers, including the Indianapolis Star, reported on how he traveled by train from Chicago to Los Angeles for two days to rush up the steps of Edith’s home and propose in August 1911. Edith dropped everything as Balke ushered her into a waiting taxi destined for a church. Legend has it that Edith dubbed her future husband with the “Fearless” moniker in 1908 when awed by his daring at a race meet; she stood and screamed the word. When friends introduced the two, the connection was immediate.They wed six months after Balke graduated from “trade rider” status to full professional in March 1911. After that, they were inseparable, as Fearless and Snooks swept the country enjoying an amazing string of victories. No greater testimony to his success exists than Edith’s thick scrapbook packed with headlines shouting news of hundreds of race wins and speed records. Born in Tyler, Texas in June 1891, Balke’s natural skills as a motorcycle rider became apparent after moving to Los Angeles with his family in 1906. Using a 1.75-HP Indian he had ridden while delivering telegrams, he entered a novice race at Los Angeles’ Agricultural Park horse track on September 9, 1907 and won. In 1908 he met the challenge of more experienced competition, including a second place again at Agricultural Park. The year also presented him with a stern test of his resolve when he was seriously injured in a tragic accident on September 7, 1908.While practicing at 60 MPH on a 3-HP Thor, Balke struck seven-year-old Lester Webb who had sneaked onto the track with several older boys. Webb was killed instantly. Balke, thrown from his bike, suffered head injuries, a broken collar bone and fractured ribs. He was unconscious for 72 hours. Balke recovered, and undeterred, resumed his career with determination. He ventured out of California for the first time when he raced in the August 1909 race meet at the Indianapolis Motor Speedway. This was the Speedway’s first motorized competition and the track’s original crushed stone running surface proved treacherous. Balke, now with a Merkel factory ride, was among the few that took up the challenge, snaring a second place in a 5-mile sprint for amateurs behind Indian’s Fred Huyck. Balke attained national recognition in 1910 after joining the top factory team of the day, Indian. He began winning races regularly, especially at the Riverview track in Chicago, where he was a contract rider. Always popular with the fans for his daring, he packed the stands. At the end of the year he returned to Los Angeles and on the first giant board oval built to support race cars he set the world’s amateur motorcycle speed records for one to 20 miles on New Year’s Eve, 1910.Unfortunately, the records were disallowed as officials had not inspected his machine. His promotion to professional status the following March occurred before he could schedule another run at the amateur records. Balke continued to win but the competition was intense in the professional ranks. While Balke was widely regarded as a “clean” racer, he lived in a roughneck world and understood he had to demand respect from his competition. He wasn’t above flinging his fists and wrestling in the dirt with an unyielding competitor in the heat of post-race confrontations. Punching, hooking handlebars and pulling at one another’s arms or sweaters were part of the game. Their bikes looked like today’s mountain bikes, but riders raced at over 90 MPH, sometimes jabbing and kicking at one another.Part of Balke’s greatness was that he took such tactics to another level. Not only did he know his own bike inside-out, he studied his competition and the tracks. Even when he didn’t have the best bike, he could find a way to win.On the gravel track at the Alabama State Fairgrounds in October 1911 Balke removed his rear racing tire and replaced it with one of a special corrugated tread. The tread design kicked up a shower of small rocks that cut his competitor’s faces and broke a couple of pairs of goggles. “Red” Armstrong, another rider of the day said, “All in the game, if you don’t get the other fellow, he will get you.”Balke’s teammate at Indian was their lead rider, Jake De Rosier. By 1911 Balke won with such frequency that an intense rivalry developed between the two men. De Rosier was 11 years older and may have felt the threat of a younger man’s star rising. When late in 1911 De Rosier sent a telegram complaining to Indian executive Oscar Hedstrom about the performance of their bikes and added Balke’s name without consulting him, their relationship was effectively destroyed. De Rosier was fired and Balke suspended. Ironically, both men were hired by Excelsior, the best alternative available. They battled furiously on the track and despite the danger of the situation, it was tremendous theater. A grudge match was arranged on March 12, 1912 at the super-fast, Los Angeles Colesium Board Track. Predictably, the results were tragic.Spectators shrieked as the two men bumped and pushed each other at 90 MPH. Finally, while racing side-by-side and crowding one another, Balke’s bike slipped off the banking at the bottom of the track and skidded into De Rosier. Both men slammed violently to the hard surface. Balke was stunned, but stumbled to his feet. De Rosier, unconscious, suffered terrible injuries to his left thigh and leg. De Rosier endured three surgeries over the next several months to repair the damage. His health steadily deteriorated until he died in February 1913. He was inducted into the AMA Hall of Fame in 1998. Balke’s career continued to flourish. He returned to Indian as their star rider and in his crowning achievement, won America’s first national motorcycle road race at Elgin, Illinois on July 4, 1913. Covering the 250-mile race over public roads at an average of 55 MPH, Balke led an Indian sweep of the first five finishing positions. Teammate Cannonball Baker finished second, five minutes behind. Aside from a “smothering” of kisses from wife Edith, the prize for his efforts was $500 and a two-foot tall trophy. These happy times came to an abrupt end less than one year later at the Hawthorne dirt track near Chicago. On June 8, 1914, just short of his 23rd birthday, Charles Balke was killed in a bizarre accident. While practicing with two other riders, he crashed into a horse-drawn, two-ton roller that was conditioning the track. Blinded by the dust of a rider he was trailing, Balke had not been warned the roller was on the track. Incensed by the negligence of the race organizers, all the other professional riders withdrew from the race meet. In subsequent days Edith Balke dutifully put the finishing touches on her husband’s scrapbook, including obituaries, news of the funeral and one of her thank you cards.